Forgive me if I gush - this is the most comfortable sport-style racer-back bra in the universe! 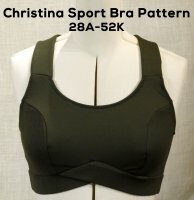 No exaggeration: 1. under bust wrap band feature is super comfortable and non-binding 2. wide, covered straps do not bind, chafe or hurt tender shoulders (even after two shoulder surgeries) 3. accommodates large (38J) bust size without creating uniboob or total compression attempts and finally 5. very comfortable for lounge, sleep or casual wear. I sewed them up without seeing blog videos, but they are a great guide - I was too eager to sew it up and didn't stop to look first.